The cause of food waste differs in Western societies from other parts of the world. In the West and other more affluent regions, food is abundant and most waste occurs at a place of sale or in the home. Food waste in many areas of the globe, however, is the result of a lack of sufficient technology and infrastructure. Too much food rots in the field or between harvest and the market. Solutions to the problem of food waste must be tailored to its cause. Waste of foods in countries with limited infrastructure and lack of access to simple technologies tends to occur before it reaches the market. For too many people their diet relies solely on food from plants due to poverty and not by choice. Insects, wild animals, plant diseases and lack of water destroy too much of a crop before it can be harvested. An inability to use more advanced agricultural techniques, organic or conventional, limits the amount of grains, fruits or vegetables that can be harvested on a given plot of land. The richest, most fertile fields may be reserved for high-value export crops. Lack of adequate cooling or drying facilities leads to more and faster decay of the crop between field and market. Poor roads and too few vehicles to transport the crop to market, means that more raw food will rot before it gets to market or will need to be consumed soon after it is bought. Advanced technology is not necessarily needed, but appropriate technology needs to be available to decrease the massive amounts of waste that is generated. In parts of the world where there is an abundance of technology, food is relatively inexpensive with most of the waste occurring after it reaches the market. Because food is readily available at a decent price, wasting it does not seem to be that big of a deal. If it doesn’t look good, then don’t buy it. If it doesn’t taste that good, just toss it. Appearance is a key trigger for buying a fresh fruit or vegetable. At one time, surface imperfections were considered to be badges of honor for organic produce. Now, it seems that even organic items must live up to the visual standards of their conventional counterparts. Supermarkets allow for a certain amount of shrink (calculated in dollars for produce that will not be sold) to ensure that their customers will not go away disappointed when there is an empty space on the shelf for a particular item. Many restaurants prepare more food than they expect to sell to ensure that their customers don’t walk out crushed when their favorite entree is no longer available. At home, many of us buy more than we need, while some containers migrate to the back of the refrigerator to be forgotten until it is time to throw away the rotten food. When approaching an insurmountable problem, it is usually best to identify the most likely cause and start there. In Western society we should start with food wasted after it arrives at the market. Restaurants prepare more food than they need or discard fresh ingredients they do not use. Many up-scale restaurants and chains donate their leftovers to help feed the homeless. Other restaurant chains offer discounts on their meals purchased after 9:00 or 10:00 PM to help prevent waste. Supermarkets send excess non-perishable products and fresh produce to food pantries. In my experience as deli man at our local food pantry many of our clients pass up the opportunity to get exotic foods like hummus, quinoa or risotto. They want real food. When we get large amounts of certain items, it becomes difficult to move it all before the expiration date. Some of the fresh vegetables are in good shape, while others are past their prime. Carefully plan meals to rotate your stock so something at the back of the refrigerator doesn’t expire before it is rediscovered. Many more such hints can be found in Waste and Waste Free Kitchen Handbook. Despite our best efforts we all encounter waste in the form of (1) inedible portions of edible items such as woody ends of asparagus spears, (2) food that has spoiled to the point that it is no longer edible, (3) food that nobody in the house will eat, or (4) food that could be considered a safety hazard due to improper storage or handling. When disposing of this waste we should be guided by minimizing the effect to the environment. 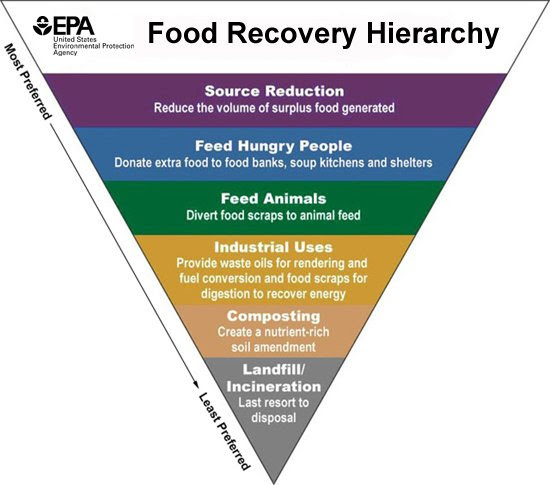 The EPA has provided us with some guidelines in its Food Recovery Hierarchy. Unless we grow our own garden, we can’t do much about source reduction, but we can donate unopened, non-perishable foods to a food pantry. We can feed our table scraps to our pets, but we have a growing obesity problem in the dog-and-cat community. Composting is a very good idea for those with the time and the motivation, but it can be messy. The last and least desirable outcome is to fill up the landfill, which is why the Waste Free Kitchen Handbook and the chapter on food waste in Food Policy strongly recommend use of a garbage disposal to save the landfill and keep food waste from continuing to pollute as it rots. Click on book cover to get more information from Amazon.